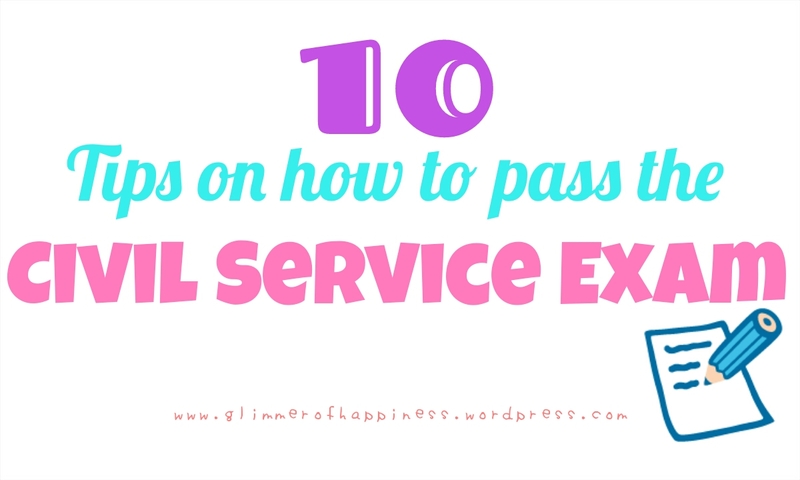 Passing the Professional Civil Service exam will give you a lot of benefits. It is also one of the basic requirements in applying for government position and would also make you eligible in joining the PNP. 1. Prepare all the requirements. Access the CSC’s website at www.csc.gov.ph to know examination announcement, testing centers, the requirements and procedures, and other relevant information. They are very keen with the requirements especially on your photos so make sure to follow properly. 2. Apply early. Apply personally at your nearest Civil Service Commission Regional Office (CSCRO) or CSCRO’s Field Offices bringing all the requirements needed. This will give you time to review and relax for the said examination. 3. Review. There are a lot of bookstores that sell reviewers for CSE. Familiarize yourself with the categories of the exam. I bought mine at National Bookstore and it surely gave me idea on how the exam will be. There are also online reviewers and some would even sign up at a review center. Competency areas are verbal (English and Filipino), analytical, numerical and general information (study the Philippine Constitution). Passing score is 80%. 4. Visit the school or room where your exam will take place. For you not to get lost and will save you time on the day of exam. In my personal experience, I went to my testing center with my friend and familiarized ourselves with what route to take since we learned that it will take us an hour or so to get there. 5. Arrive early. This will give you time to relax and not cram before your exam starts. Your proctor will also check your name on the list and ask you to fill up some forms. 6. Make an educated guess on your answers. The exam is in multiple choice but you would still find yourself doubting on what to answer. Eliminate those choices that are completely out of place until you’re down with the best answer. Don’t just use eeny meeny miny moo in answering. 7. Do not wear long sleeves. This is something I did not know. Haha! I wore a knitted jacket not knowing that long sleeves are not allowed so I had to roll it up to my elbow. 8. Sleep early and eat breakfast the next day. The exam might make you bored and will make you sleepy. Seriously, I yawned a lot of times during the 3-hour exam because I wasn’t able to sleep early the night before because of excitement. LOL! 9. Be optimistic. “I WILL PASS THIS EXAM!” Hope and expect that it will turn out well when you, yourself, know that you did your best in your review and that you’re well prepared. If you’re from the south, like me I’m from Pasay, best way is to ride the MRT and descend at Quezon Ave.
You will then see the Quezon Avenue overpass. Cross that pass going down near the DILG building. You will see jeepneys there with Welcome Rotunda signage or you can ask the driver if they pass at Banawe. Ask the driver to drop you off there. At the corner of Banawe Ave. there is the McDo restaurant and an overpass. Cross that overpass and just walk until you’ll reach Kaliraya Street. Pangalawang kanto yun sa right side. 🙂 Turn right and lakarin lang hanggang sa makita mo na ang office ng Civil Service. Thanks for the tips, but remind folks that the government does discriminate with age. No one under the age of 37 can apply… Of course that is at least federal jobs. Thank you! 😊 I really hope so too. This is nice. Thanks girl. Thank you! 🙂 and you’re welcome! Nice tips! I passed it a few years back and I still remember that jittery feeling after taking the exam. I think I did so bad at math, I really didn’t think that I’ll even pass haha! Me too! I had a hard time with Math but it turned out na mas mababa pa pala Gen. Info ko. Haha! Unexpected talaga. Naiyak ako nung malaman kong nakapasa ako. HAHA!